In the digital age, patience is an increasingly dying virtue across all aspects of culture: film, music, television, books – the need to grab attention in a short period of time and desire for instant consumption very often supersedes the actual development of the craft. The same is ultimately true of football and the viewing habits of spectators. At the top end, the leading 20-30 clubs in the world, it’s a fair assessment to say more fans don’t go to games than do, instead choosing to watch via television or streams around the world. Or even, not watch the games at all and rely on carefully-edited highlights. Not to diminish the passion those followers have for their respective clubs but the short-term nature of that commitment and the platforms through which football is being consumed have a natural side-effect of the need for instant gratification – there is precious little time to win over hearts and mind. A social media mindset increasingly rules. Scroll, like, don’t like, swipe right, block, mute etc. It’s a disposal mindset that is also, to an extent, mirrored in the decision making of clubs when squad building. Players have always been interchangeable assets but so wide is the scope in the scouting of the game’s biggest clubs, if an individual doesn’t work out, there are a number of potential solutions to be found elsewhere. This is all simplifying and generalising and potentially inaccurate but that mindset is endemic in the criticism that Naby Keita is suddenly receiving as domestic football enters the international break and a black hole for discussion and debate opens up. Our friends at Football Whispers take a look at the Guinean midfielder’s struggles over the first two months of the season. 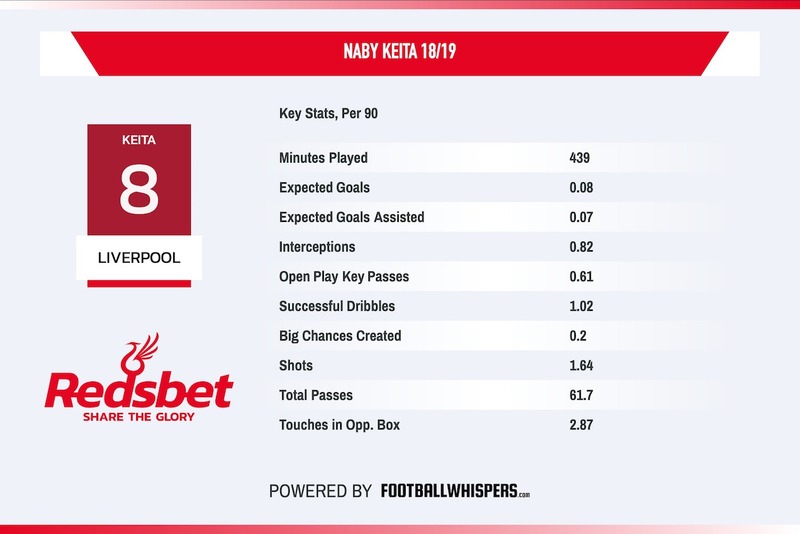 Keita has ultimately not had the impact many expected when Liverpool first agreed his transfer in the summer of 2017 and the 52 minutes he spent on the field against Manchester City were unremarkable. Keita was supposedly brought to the club to dominate games of this magnitude, to provide fresh impetus in midfield and be that driving force in the middle of the park a la Steven Gerrard. Instead, the 23-year-old was largely a passenger after replacing the injured James Milner against City. Keita completed just 82.1 per cent of his 29 pass attempts, had fewer touches on the ball (31) than goalkeeper Alisson, made just one tackle and one interception and didn’t complete a single dribble, shoot or create a chance. That, plus his previous 387 minutes of Premier League action, in which he made four starts and three substitute appearances, has been enough to form judgement that the £52.75million Liverpool paid to RB Leipzig already looks questionable. Ironically, in the age of short-termism, short memories are also a habit and the example of the last major recruit from the Bundesliga Liverpool brought in seems to have discounted in the conversation around Keita. Roberto Firmino may play in a different position to the Guinean but it took him a good 18 months before he had any kind of recognisable effect on the team. Now the Brazilian is virtually indispensable. Sometimes, people just need time to adapt. 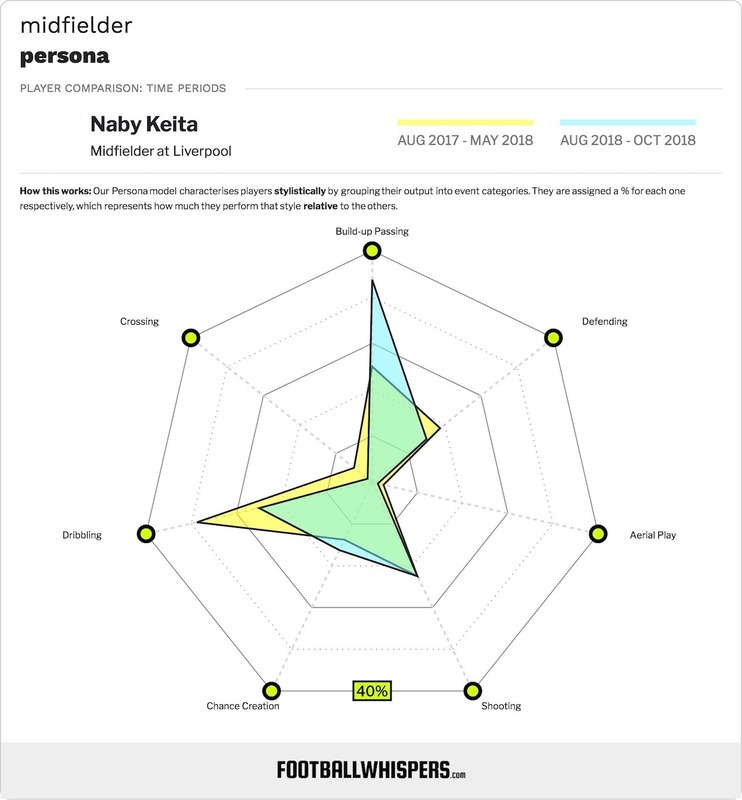 When comparing his start at Liverpool with his final season in the Bundesliga, with the exception of total accurate passes and, as a result, forward passes, overall passing accuracy, aerial duels won and, slightly bizarrely touches in the opposition box, Keita is underperforming on every single conceivable metric. He isn’t tackling, creating, dribbling, shooting or bossing games anywhere near to the extent he did in Germany. On the one hand that could be seen as troubling but, on the other, it shows how much he can improve and also that we shouldn’t be surprised. Keita is 23, in a new country, city and league and is working under an intense figure in Jurgen Klopp. There is also the tactical aspect of Klopp’s approach which has maintained a high press but his midfield as a whole are playing with a sense of attacking inhibition, as greater focus has been placed on defensive responsibility. If Andy Robertson and Trent Alexander-Arnold or Joe Gomez are to charge up the flank, as they so regularly do, the midfield must sit. Especially in a game against a team like Manchester City who are terrifying when attacking in transition. Keita’s rampaging runs for Leipzig – 3.07 successful takes on per 90 last season, 1.02 this – have been curtailed for now. Eventually, as he finds greater confidence and Klopp trust in him to break forward the latter number will start to catch the former. Apart from the lack of patience as a by-product of 21st-century football habits, there is also something else at play here; namely, the sheer breadth of information available about players means opinions are formed often before an individual has been seen. Keita was the saviour of Liverpool’s midfield before many had even seen him kick a ball. As a result, his position as an individual trying to find consistency in his game and adapt to his new surroundings, club and teammates doesn’t fit in with such inflated expectations. Keita was just too impactful and exciting a player with Leipzig not to make a mark at Anfield. How and when he does it is unclear, and in itself is an enjoyable mystery, but given the investment, and his management in the development of Firmino, Gomez, Andy Robertson and others who have slowly come to the boil, you can bet Klopp will show him the requisite patience to succeed.